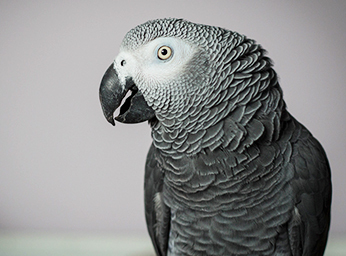 In addition to my human family and my dogs, I live with three African Grey parrots: Milo is a Congo African Grey parrot who has lived with me for 7 years; Roy is a 28- year old Congo African Grey parrot who has lived with me for 3 years; and Sparky is a 7-year-old rehomed Timneh African Grey parrot who has lived with me for 1 year. Being an animal behaviourist by profession, I am passionate about educating the public with regards to the behaviour and welfare of these magnificent creatures, and my family and I also have the privilege of sharing our home and lives with them. Milo came to live with me when he was weaned. He was lucky that his parents and siblings raised him along with his human caregivers. 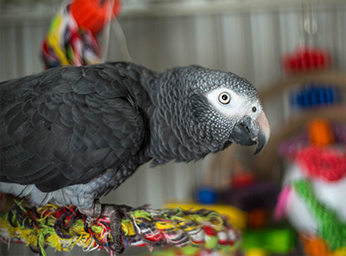 Consequently, Milo is a well-socialized and sociable parrot who has few fears or phobias. From an early age, Milo enjoyed more time out of his cage than in his cage. He can choose which family member to spend his time with and currently prefers to hang out with my 18- year- old son Connor, although he will come and spend time with me in the TV room. Each evening, Milo has a flock dinner with us including having his own plate at the dinner table. I have a Pak-O-Bird carrier for him and he enjoys trips out of the house to coffee shops and restaurants and enjoys joining the dogs and me on walks. We have been lucky with Milo, as he seldom bites or becomes frustrated with us. Roy’s story was reported in newspapers throughout the world. I believe that he had one caregiver whom he loved deeply; he still mentions her name and calls for her. She died when he was 24 and he was heartbroken and unprepared for life without her. To make matters worse, the caregiver’s husband found a new partner and Roy was moved into a small cage in the garage where he remained for 3 years, on his own, with only a brass bell for company. A house move meant that Roy was surplus to requirements, and a bird rescue was called to collect him. By this time, Roy had plucked out almost all of his feathers. 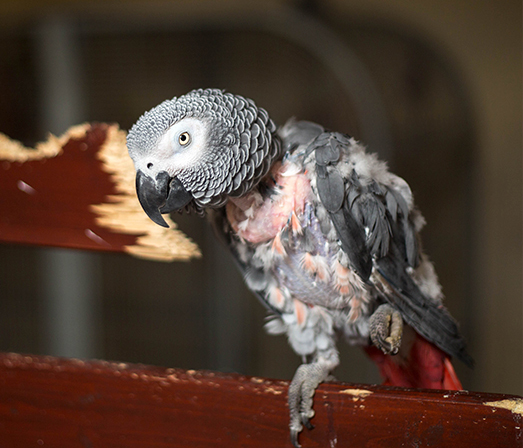 I met Roy in October 2013, and I had never witnessed a more traumatized and emotionally shut down parrot such as the Roy that I first saw, who was frightened and weary of my family and me. Roy was frightened of the cage door being closed on him, so I removed the door. He reacted to any desire on my part to touch him by biting, so I avoided touching him. If I went too close to his cage, he would mutilate himself, so I gave him space. Those first few months were difficult for all of us, as I set about teaching Roy to live and trust once more. It has been a difficult and emotional journey for us all, but I am delighted to report that in April 2015, Roy came out of his cage and has since made it his mission to turn my entire house into a nesting box! Roy wanders around the house and spends time with all family members. He talks to us, engages with us, and he no longer plucks his feathers. Sparky came to live with my family and me in late summer 2014. His first caregiver had died and Sparky disliked the lady of the house who, I believe, tried her best with him. Due to his flying at her, landing on her head and biting her (hard), and the fire alarm sound he made continuously, she felt out of her depth; and, as he was spending more and more time in his cage, she relinquished him to a rescue. Initially, my home was a “safe home” for him while a more permanent situation could be explored. As time passed, it became apparent that Sparky had behavioural issues; and, rather than having him be passed from home to home and becoming increasingly angry and frustrated with the world, I chose to adopt him. It took me six months to reduce the screaming and fire alarm sounds to zero. Sparky is a work in progress, and his incidents of using aggression towards me are now zero; and, he is rarely aggressive towards family members, although he remains very territorial of his cage. Through working with Sparky, I have developed a perfect understanding of how some parrot caregivers can become apprehensive of their parrots. It’s difficult not to be concerned by a parrot who flies towards you and attacks you! 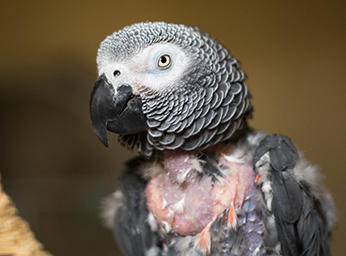 Read my ‘A Birds’ Eye View- A Breakdown in Relations between Parrot and Caregiver‘ presentation.